• It will help keep your head above the water. • If it's too big, the life jacket will ride up around your face. • If it's too small, it will not be able to keep your body afloat. •Life jackets designed for adults will not work for children! • Check the manufacturer's label to ensure that the life jacket is a proper fit for your size and weight. • Make sure the jacket is properly fastened. • Hold your arms straight up over your head. • Ask a friend to grasp the tops of the arm openings and gently pull up. • Make sure there is no excess room above the openings and that the jacket does not ride up over your chin or face. • For the best fit, try the life jacket in shallow water under safe and supervised conditions. Today's life jackets may not be what you think — many are lightweight, easy to move in, and come in many sizes, styles, and shapes for every person and every sport. Note: Boating out-of-state? There may be a different age requirement. Check with that state's boating authorities before heading out on the water. Today's life jackets may not be what you think-many are made specifically for anglers and hunters: they're lightweight, easy to move in, have multiple pockets for bait or ammunition, and even come in camouflage. Outdoor sports enthusiasts can even be sure their trusty companions are safe on the water, as there are even life jackets for hunting dogs! Four-legged family members need to stay safe on the water, too. 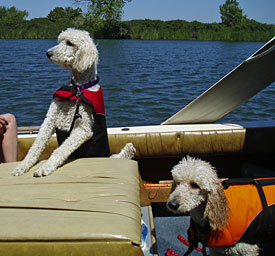 There are a variety of life jackets made specifically for dogs (and even a few other types of pets). Check for them at marine supply stores and pet shops. A salesperson can help you measure your pet for the right fit.